FIRST LASER - 1960. 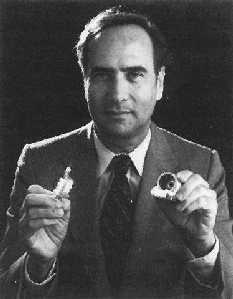 The first operable laser was constructed by Theodore Maiman while employed at Hughes Research Laboratories as a section head in 1960. He developed, demonstrated, and patented the laser using a pink ruby medium. TRAID FOTRON - 1960. 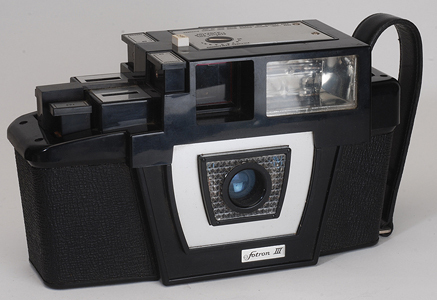 The Fotron was a camera manufactured in Glendale, California by the Traid Corporation and sold door-to-door during the 1960s. Aimed primarily at women, it was marketed as a simpler alternative to "complicated" traditional cameras. 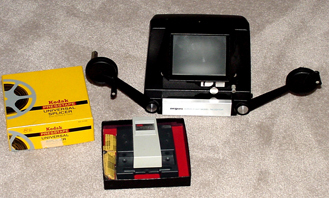 The Fotron had a number of innovative features, including a built-in electronic flash, rechargeable battery, motorized film advance, and push-button exposure control. It used standard 828 rollfilm packaged in a proprietary snap-in cartridge. The film had to be returned to the manufacturer for processing. 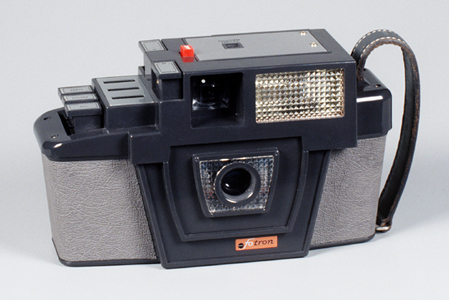 The first Fotron was grey, the second (the 1200) and the third (the Fotron III) were black. 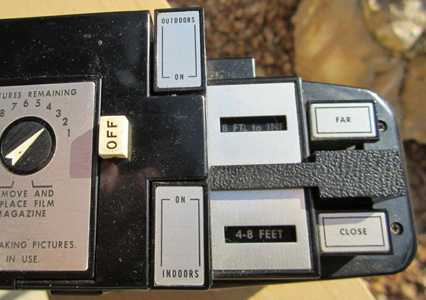 The first two had three buttons on top for adjusting distance, the Fotron III had only two. The camera had to be charged for 18 hours to shoot one 10-exposure cartridge, and 72 hours for more than one. Prices varied considerably depending on what the sales person was able to obtain, usually $150-$300 ($1,166-$2,333 in 2012 dollars), but sometimes up to $500 ($3,888 in 2012 dollars). These prices were considered so outrageous in comparison to the camera's actual value that some buyers eventually brought a lawsuit against the company. In actual practice the Fotrons were found not to be a simple alternative to traditional cameras and many were seldom used. As a result, they are readily available on eBay in excellent to like-new condition. NIKKOREX-8 - 1960. Nikon's first entry in the home movie market. The Nikkorex-8 was was the first attempt by a camera manufacturer to build a CdS into a camera body, either still or movie. KODAK AUTOMATIC RETINA ! - 1960. Retina Automatic I is a 35mm film viewfinder camera made by Kodak AG and produced between 1960-63. Kodak's three Retina Automatic models were the first Retinas to have automatic exposure control. Built on the same common chassis, they differed purely in regard to lens & shutter configuration. MINOLTA 16-II - 1960. An example of the many sub-miniature cameras available to collectors. The Minolta 16-II used 16 mm film and is an evolution of the Minolta 16. Lens: 22mm (f2.8-16), fixed-focus regulated to approximately 3 meters. Shutter 1/30 to 1/500 sec + time exposure. Items shown in the small envelopes are attachment lenses for telephoto and close-up. The above camera in like-new condition with manual, lenses and original box was purchased on eBay for only $25. 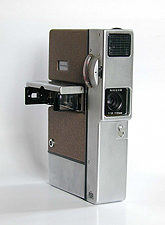 POLAROID MODEL 900 - 1960. The Model 900 was Polaroid's first completely automatic exposure controlled shutter 1/12 sec - 1/600 sec., aperture 8.8-82. AGFA OPTIMA I - 1960. Successor to the original Optima of 1959. Lens f/2.8 45 mm. Shutter 1/60 - 1/500 sec. The Optima I was available for around $70 in 1960 which would be about $515 in 2010 dollars. KODAK MOTORMATIC 35 - 1960-2. The Motormatic was Kodak's last American made 35mm camera. The Motormatic name was derived from the fact that the film was driven by a spring-wound motor using a large knob on the bottom of the camera. The MSRP was $109.50. In 2012 dollars that would be about $850. Lens f/2.8, shutter 1/40-1/250 sec. EUGENE F. LALLY - 1961. While working at JPL and later at Convair, Eugene Lally wrote internal and space conference papers proposing various spacecraft designs and methods to explore the Moon, Mercury, Mars, and Jupiter. He presented a paper to an American Rocket Society conference in 1961 on "mosaic guidance". He took the digitization concept developed in 1957 by Russel Kirsch to its next logical step with his mosaic guidance proposal whereby arrays of detectors in a camera would detect the position of objects in space for the purpose of guidance and navigation. Lally is given credit by some as having coined the term "digital photograph," but we haven't been able to independently verify that claim. The basis for this claim appears to be an article written by Lally himself, How Spaceflight was Born, a large portion of that article being devoted to contributions by Lally (see fourth reference below), with lesser portions of the article being devoted to the contributions of Robert Goddard, Hermann Oberth, Wernher von Braun and Krafft Ehricke. 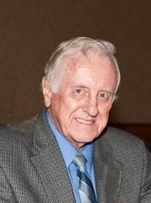 According to Lally, Fairchild Semiconductors approached him in 1973 with a CCD and asked him to build a digital camera prototype similar to his Mosaic Guidance proposal. Lally said he declined because he was too busy working on space programs, developing products with his company and other activities. Lally said that he suggested they contact Kodak which they did and Kodak accepted. Lally's idea of an electronic camera using digitized information was a natural progression from the Amstutz Electro-Artograph (see 1895) which could scan photographs and transmit them over wire, A.A. Campbell's electronic camera (see 1908), the Bartlane transmission System (see 1920) which digitized images using punched tape then transmitted them by cable, and the Kirsch digital scanner of 1957, which made a digital photo of what it saw. However, in a 1958 aritcle by L.A. Mannheim, How Autlomatic Can You Get?, Mr. Mannheim states, "For still cameras we want an even simpler sytem: again electronic, and not photo-chemical. Such camera will be small enought to hold in one hand, yet will record a permanent and visible electric picture on single plastic discs the moment you expose.....And for prints you would put the discs through a similar machine again." Photoguide, December, 1958. Combinging the 1957 Kirsch digital scanner, the 1920/1929 Bartlane Transmission System, the 1908 A.A. Campbell electronic camera, and numerours science fiction articles with Mr. Mannheim's statment, it would seem that the possibility of some type of electronic digital photography system was viewed as a future posibility long before Mr. Lally's 1961 paper. It is difficult to independently verify many of the claims by Mr.Lally as most of the information on the Internet seems to be based almost entirely on statements by Lally. One editor of the Wikipedia article on Mr. Lally removed much of what he referred to as peacock material (self promoting) contributed by anonymous sources, but presumed by the editor to be from Lally himself. He twice nominated the article for deletion altogether because of "outrageous and inflated claims,"one nomination being approved in September of 2009, but rejected in October of 2011. At the same time, a defender of Lally vigorously objected to the editor's comments and called it, "discrediting the life and work of a genius." Until an independent and reliable source either verifies or discredits Mr. Lally's numerous claims we must defer judgement on his contributions to digital photography. 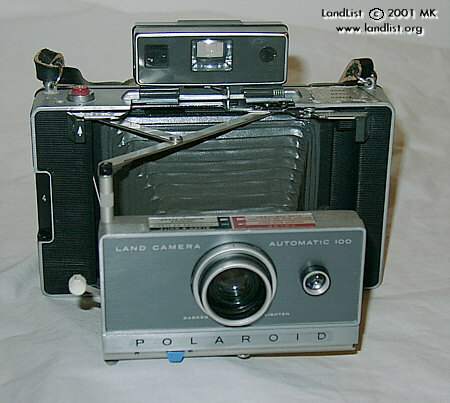 POLAROID J33- 1961. The J33 was produced from 1961 to 1963. 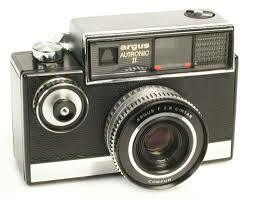 It had a plastic single element meniscus lens and used black and white 3000 speed Polaroid type 30 roll film. It�€™s shutter speed was controlled by a selenium cell. Shutter 1/15 second - 1/1000 second. There was a fold out flash to the right of the cameras face. it twisted to provide a direct flash or a bounce flash. Original MSRP was $74. The above camera in near mint condition was donated to DigiCamHistory.Com by Ron Hardwick, one of Ohio's top professional golf instructors. 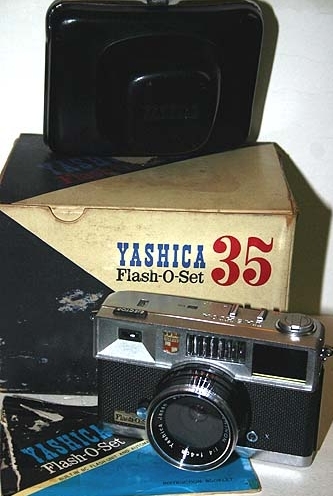 YASHICA FLASH-O-SET- 1961. 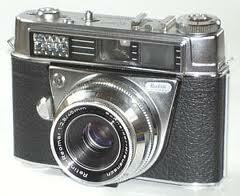 Although its appearance is that of a rangefinder, the Flash-O-Set was really a point-and-shoot camera. Lens: 40mm fixed focus, aperture ?4.0. Shutter: fixed at 1/60 second. The Flash-O-Set was one of the few 35mm cameras to have a built in bulb flash holder. It required a peanut-sized AG-1 bulb which fit into the socket on the front upper left of the camera (as seen from the front). 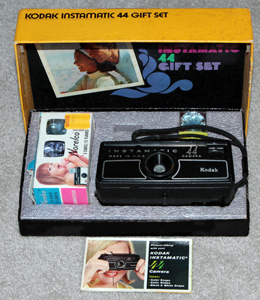 The above camera in mint conditon with case, manual and original box was purchased for only $20. FIRST MANNED SPACE FLIGHT - 1961. On April 12, 1961, Yuri Gagarin of the Soviet Union became the first human to orbit Earth. 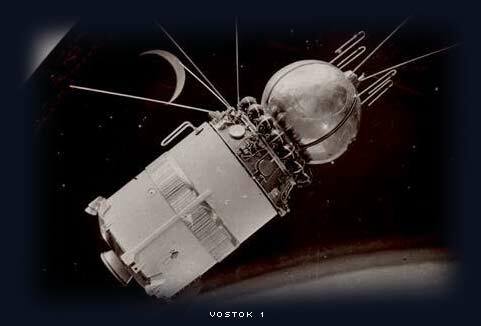 The name of his spacecraft was the Vostok 1. Vostok 1 had two sections: one section was for Yuri and a second section for supplies needed for survival such as oxygen and water. Vostok 1 circled Earth at a speed of 27,400 kilometers per hour. The flight lasted 108 minutes. Vostok's reentry was controlled by a computer. Gagarin did not land inside of Vostok 1. He ejected from the spacecraft and landed by parachute. THE VIDEO DISK - 1961. 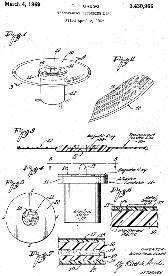 David Paul Gregg first envisioned the VIDEODISK in 1958 He patented it in 1961 and again in 1969. Click on image for enlarged view. 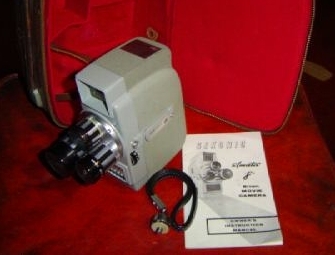 BELL & HOWELL 424 PERPETUA ZOOMATIC - 1961. 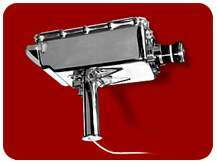 There were several models of this camera, incuding the 414PD which became famous as the one Abraham Zapruder used to film the Kennedy assination. The P stood for power zoom and the D for dual electric eye. The Zoomatic was an upper level consumer camera with prices ranging up to $208, which would be about $1500 in 2010 dollars. The case was of high quality leather both inside and outside. However, many film movie cameras these days can be purchased for almost nothing. The above camera in excellent condition with case and original manual sold for $9.99 on eBay. The case alone is worth far more than that and could be used for a wide variety of purposes other than as a camera case. ANSCO ANSCOSET - 1960. 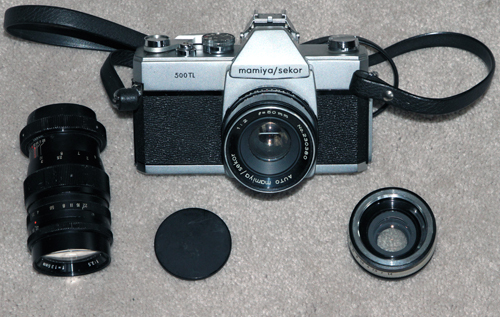 Also sold as the Minolta Uniomat. Manufactured by Chiyoda Kogaku. 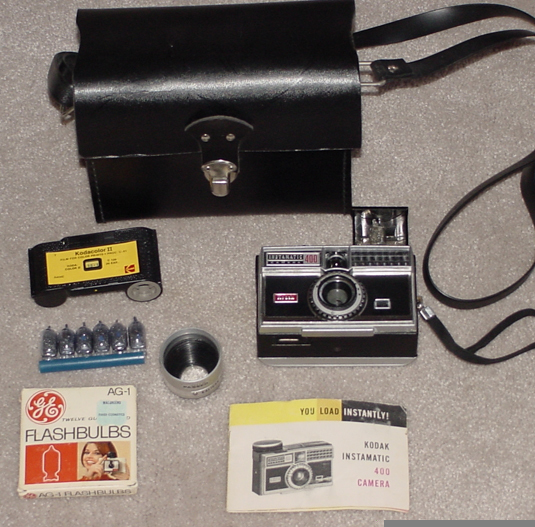 YASHICA FLASH-O-SET II- 1962. 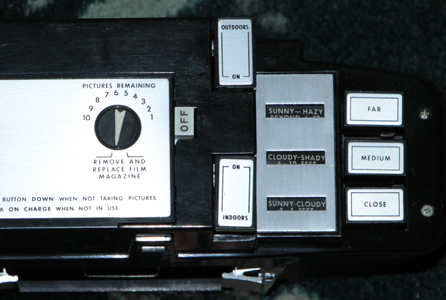 Similar to the original Flash-O-Set of 1961, but with light meter surrounding the lens. Lens: 40mm fixed focus, aperture f4.0. Shutter: fixed at 1/60 second. The Flash-O-Set was one of the few 35mm cameras to have a built in bulb flash holder. It required a peanut-sized AG-1 bulb which fit into the socket on the front upper left of the camera (as seen from the front). It could also be used with an after market flash unit as shown here. MSRP 13,800 Yen (about $38 = $300 in 2015 dollars). The above camera in very good conditon with case, flash and three flash bulbs was donated by our very dear friends Jennifer and David Buckwalter . McKeown's Price Guide to Antique & Classic Cameras, page 1027. NIKON VIDEO REMOTE CONTROL - 1962. The Nikon Video Remote Control (TV remote-controlled recording unit) was manufactured by combining the Nikon F, the 250-exposures motor drive, and Auto NIKKOR Telephoto-Zoom 8.5 - 25cm f/4 - 4.5 with the intent to simultaneously provide control of the camera functions by TV and the recording and photography by camera. An updated system was also experimented with in 1988, but neither system was marketed. TARON MARQUIS - 1962. 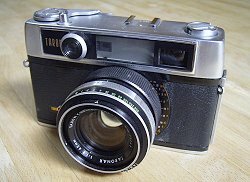 According to the Japanese Camera Museum, the Taron Marquis (also sold as the Rival Rangefinder outside of Japan) was the world's first 35mm camera with a built-in CdS sensor (Cadmium Sulfide). Lens: 1:1.8, 45mm. Shutter: B, 1 - 1/500 second. 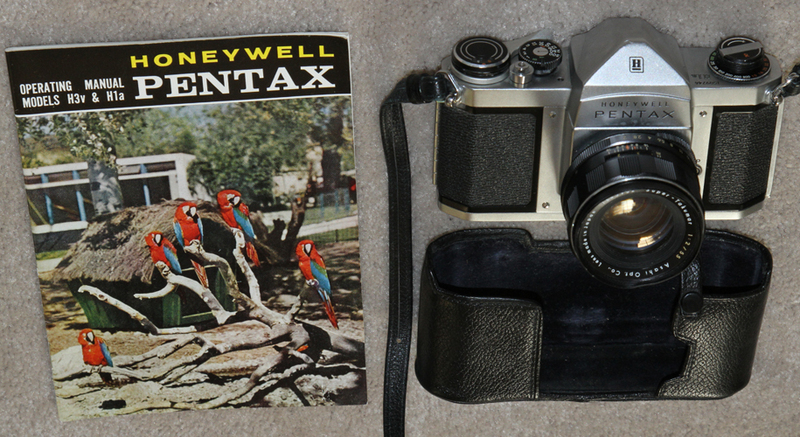 HONEYWELL PENTAX H1a - 1962. Sold in the U.S. as the Honeywell Pentax H1a, the Asahi Pentax H1a was equipped with a Auto-Takamar f/1.8 55 mm lens, or as above, Super-Takumar f/2 55 mm lens. The Super-Takumar lenses are considered to be of very high quality and those such as the f/2 55 mm above are going for $30-$50 on eBay at this time (Aug 2010), which makes this this near mint camera an even greater buy at only $12.50! Want to build a great collection at relatively little cost? Check eBay for cameras which are within a day of two of endng and with no bids. Check the photos and description and if it seems like a collectable camera place a bid for the minimum amount. Do this for many cameras and you will be surprised at how often you can obtain a very nice item for your collection at only $5-15. 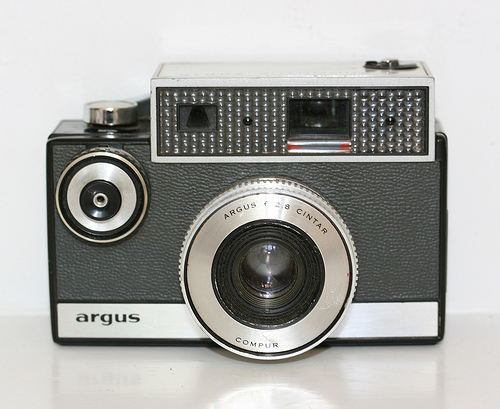 ARGUS AUTRONIC I, 1960 & II, 1962. Do a little research when buying old cameras. This Autronic I was advertised as very rare on one eBay site with a buy now price of $230, while other sites were selling identical condtion (or better) units for $11-20! If you decide to become a camera collector, McKeown's Price Guide to Antique and Classic Cameras is a wise investment even if you have to purchase an older edition (the newest edition is 2005-2006 as of August 3013). ANSCO AUTOSET - 1962. Also sold as the Minolta i--Matic. The Hi-Matic version was used by John Glen when he made the first American orbit of the earth in 1962. Lens f/2.8 45 mm. Shutter B, 1/30, 1/60, 1/125 and 1/250. Purchased on eBay in excellent condition for $10. 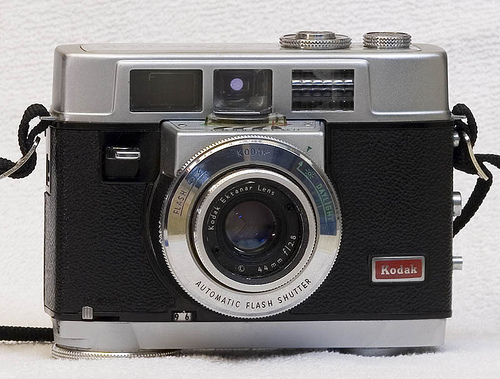 KODAK AUTOMATIC 35F- 1962-66. The 35F was one in a series of Automatics and Motormatics produced from 1959 through 1969. Lens f/2.8, 44 mm. Shutter 1/40 and 1/80 sec. Top mounted AG-1 flash socket. MSRP $99.50 (about $718 in 2010 dollars). The above camera and case in like new condition were obtained on eBay for exactly $1! CANON ZOOM 8 EEE - 1962. Original MSRP $115, approiximately $830 in 2010 dollars. Another well-made movie camera of the era which was obtained on eBay in mint condition with case for the grand price of $1. AGFA OPTIMA Ia - 1962. 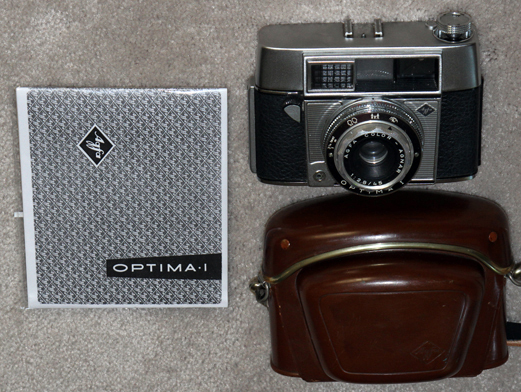 A smaller and less expensive version of the 1960 Optima I. Lens f/2.8 45 mm. Shutter 1/30 - 1/250 sec. 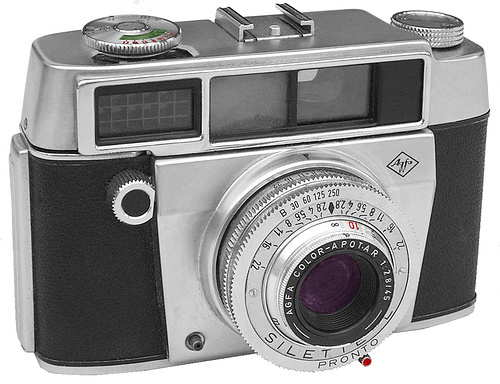 AGFA SILETTE I - 1962. 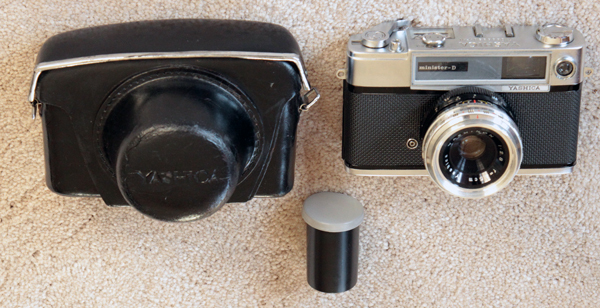 Another inexpensive Agfa with its unusual front shutter lever. Lens f/2.8 45 mm. Shutter B, 1/30, 1/60 and 1/125 sec. The above camera and case appear to be brand new. They were purchased for $13. 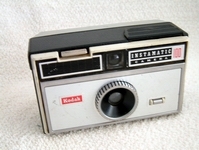 KODAK INSTAMATICS - 1963. 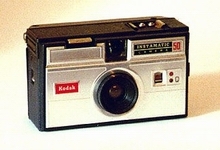 The very first 126 camera ever to be marketed, the Instamatic 50 was introduced in 1963, a month before the Instamatic 100. 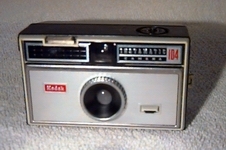 Numerous models were introduced up through the early 1970s. There are about six levels of specification, and several chronological steps relating to improved flash or metering. Instamatic 50, 100, 104 and 44 shown above. The upscale 400 is shown below with a tele lens and simulated leather carrying case. 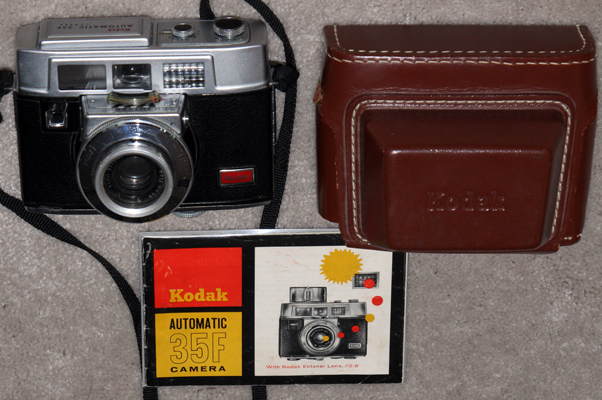 The Instamatic line of Kodak cameras makes for an interesting subset of collectibles at minimum cost. The below 400 in excellent condition along with two Instamatic 104s in excellent condition were obtained on eBay with a winning bid of $6.49! Basic Models: ~ 44, 50, 100, 104, 124, X-15, X-15F. Basic Models with Metering: ~ 300, 304, 134, 314, 333X, X-30, X-35, X-35F. Spring Motor: ~ 150, 154, X-25. Spring Motor and Meter ~ 400, 404, 414, X-45. Metered f2.8 lens: ~ 324, 700, 714. Metered f2.8 lens Motor & RF: ~ 800, 804, 814, X-90. POLAROID LAND MODEL 100 - 1963. First to use transistorized electronic shutter in a mass-produced camera, first Polaroid pack-film camera. INSTANT COLOR FILM - 1963. Polaroid introduced instant color film (type 38 and type 48 Polacolor) along with the Polaroid Model 100 camera. BELL & HOWELL DIAL 35 - 1963. The Dial cameras manufactured by Canon and sold under the Canon or Bell and Howell names were a unique approach at that time. The cameras were small, due to the half-frame format, but offered exceptional features. The lens could be focused with a distance scale on the lens or distance symbols in the viewfinder. Close-focusing to 0.8 meters. Shutter speeds were set manually from 1/30 - 1/250. The aperture could be set manually or automatically with the built-in CDS meter. Uniquely designed cameras such as the Dials 35s add interest to any camera collection and a collection made up entirely of such unusual designs is easily within the financial capabilities of anyone who would like to begin a camera collection. YASHICA MINISTER D - 1963. The D was one of many well made electronic cameras produced by Yashica that heralded a new age of electronically assisted phtography that made good photographers out of those of us who had previously hoped that at least one out of four of our photos would turn out to be properly exposed when we picked up our prints from the photo lab. One reviewer said, "As hard as we look, we can't find anything that's not to like on this camera." For those who would still like to dabble in print film or slides, or who are looking for nice display items for their camera collection, there are still many Minister Ds available on eBay in excellent condition at giveaway prices. The above cameras was purchased for only $10 and shows little signs of use (can't say the same for the case). FIRST U.S. SPACECRAFT PHOTO OF THE MOON - 1964. On July 31, 1964, Ranger 7 crashed into the Moon. Seventeen minutes before impact it snapped this picture - the first image of the Moon ever taken by a U.S. spacecraft. 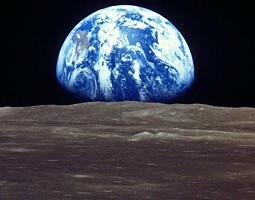 Before impacting the moon this close-up photo was transmitted by televison back to earth. FIRST ELECTRONIC CAMERA PHOTOS OF MARS - 1964. 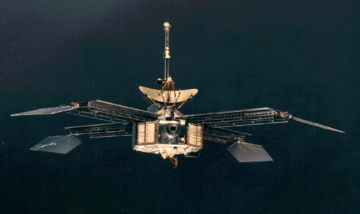 In July 1964, NASA, at the Jet Propulsion Lab in Pasadena, California, received electronic signals from video cameras on board the Mariner 4 (IV) spacecraft on its way to Mars. 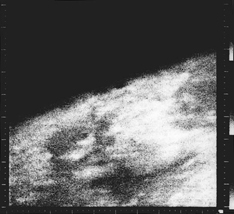 The image above is the first close-up image ever taken of Mars (NASA). Click on image below to see two larger views of the surface of Mars. 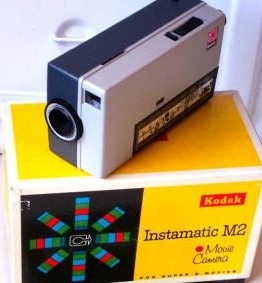 KODAK INSTAMATIC M2 - 1965. Known as the "Brick" the M2 is an example of an inexpensive Super 8 movie camera that is still relatively common in excellent condition and which can be purchased on eBay and other auction sites with box and manual for as little as $5. Introduced in 1965 together with the new Super 8 film, it was an entry-level camera with a fixed focus f/1.8 lens, manual exposure and single filming speed (18 frames per second). 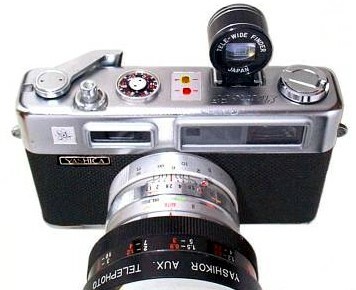 AGFA 5155 MOVEXOOM - 1964. 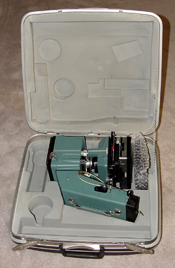 Typical 8mm movie camera of the era. Such cameras incorporated several improvements over their early predecesors such as electric rather than windup drive and electronic exposure metering rather than manual settings. 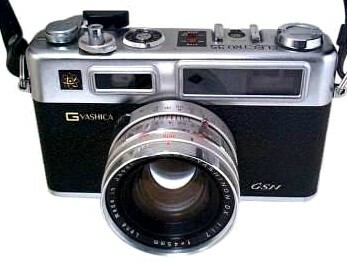 Agfa Variogon f/1.8 variable focal length lens (9-30mm). Aperture f/1.8 to f/16. Sixteen frames per second or single shot (5155 manual). 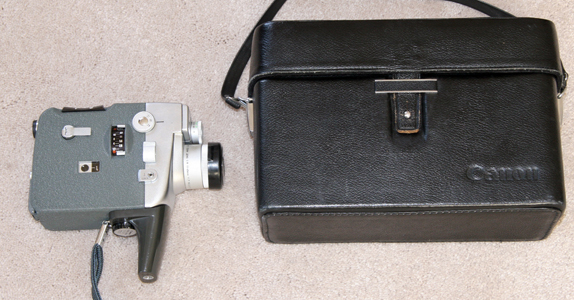 Two other 8mm cameras of the '60s were the Sekonic Elmatic and the Micro-Eye. Sekonic is well known as a maker of fine light meters, but also produced film movie cameras. If you are interested in starting a collection of your own, vintage movie cameras can be purchased very inexpensively. The two cameras below were purchased on eBay in excellent condition for a total cost of only $12.98! BEAULIEU S2008 - 1965. 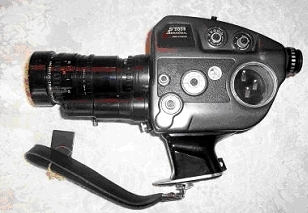 The Beaulieu S2008 is an example of a French made movie camera of the era. Beaulieu Cinema has made many fine movie cameras over the years and they are highly prized by collectors. KODAK INSTAMATIC 804 - 1965-70. Lens: Ektanar f/2.8 38mm. Shutter: B, 1/60, 1/250 sec. Film: 126 cartridge. 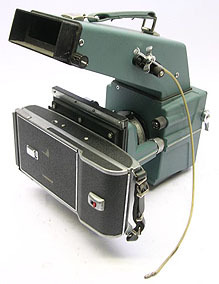 The 804 had a somewhat unusual film advance system which involved a pull tab on the outside of the camera that was used to wind an internal spring motor. The original MSRP for the 804 was $124.50 which would be about $838 in 2009 dollars. FIRST HOME VIDEO TAPE RECORDER - 1965. The Sony all-transistor CV-2000 was the first video tape recorder aimed at the consumer market - CV stood for "Consumer Video". 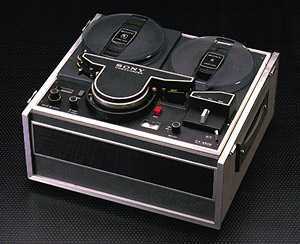 Sony's VTR weighed 70 pounds and had a built-in monitor for viewing the picture. 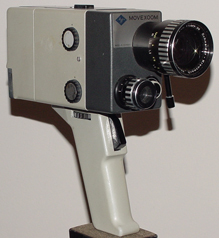 FIRST CONSUMER VIDEO CAMERA - 1965. The Sony CVC-2000 was the first domestic video camera. Intended to be used with the Sony CV-2000 video tape recorder shown five photos above. It recorded on 1/2 inch video tape. The CVC-2000 video camera was also sold with accessories in kit form as the VCK-2000 shown here. This kit was purchased off eBay in 2010 in excellent condition. The camera and mike appear to be almost unused and some of the accessory items were still in their sealed containers. The original MSRP for the CVK-2000 kit was $350, or about $2355 in 2009 dollars. The CV-2000 video tape recorder had an MSRP of $730, or about $4900 in 2009 dollars. As a result, few were sold and they are now very difficult to find. 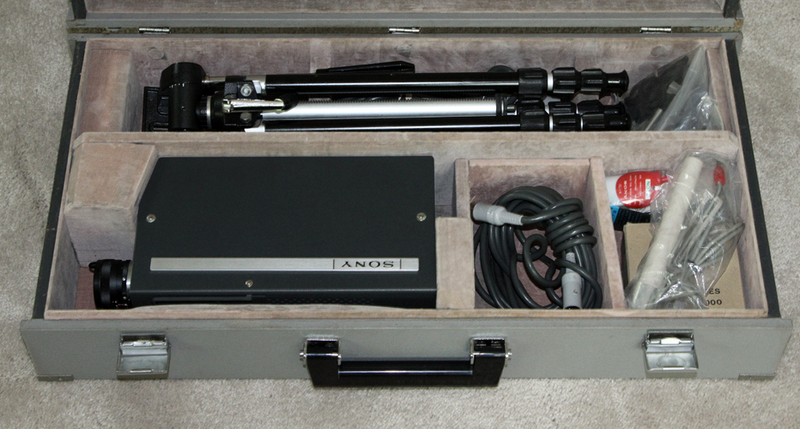 One individual who had spent his life as a Sony technician stated that he had never seen the CVK-2000 kit in person! The near new condition of this kit makes it rarer still. 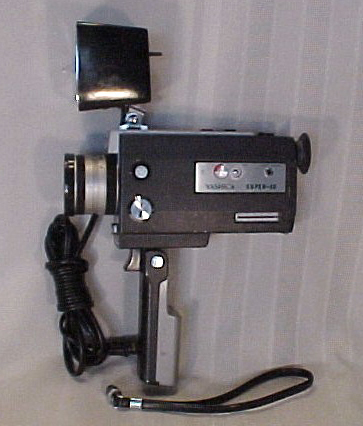 CONCORD MTC-11 VIDEO CAMERA - 1965. Andy Warhol is shown with a Concord MTC-11 professional quality video camera which he used to make a series of what were call underground movies. Richard Ekstract did an interview with him called "Pop Goes the Videotape." 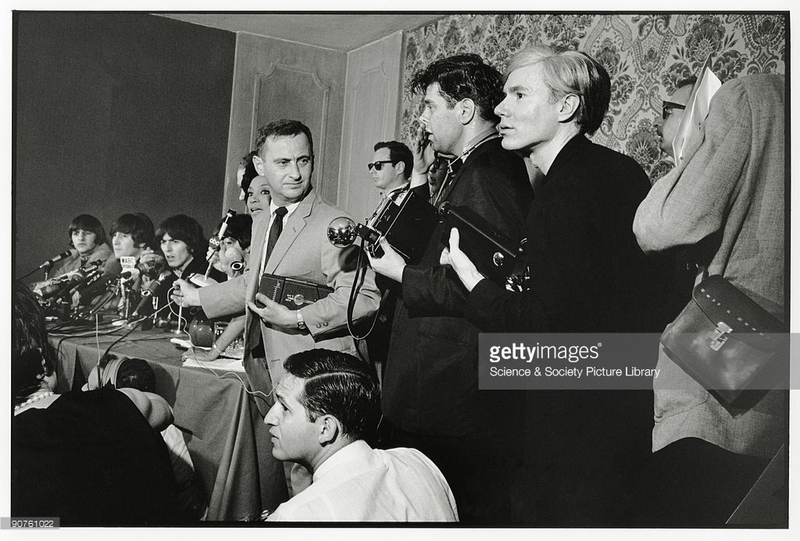 (see below) Photo and initial information about the MTC-11 and Andy Warhol were provided by Dr. Blake Gopnik. Dr. Gopnik, an art historian based at the New York Public Library, has web sites at http://www.blakegopnik.com/ and http://warholiana.com. Dr. Gopnik is searching for additional photos of the Concord MTC-11 video camera. If you know of any such photos please notify Dr. Gopnik at one of his web sites. FIRST EARTH PHOTO FROM VICINITY OF THE MOON - 1966. The world's first view of Earth taken by a spacecraft from the vicinity of the Moon. 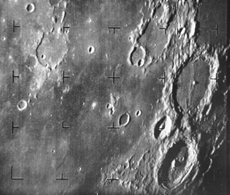 The photo was transmitted to Earth by the United States Lunar Orbiter I and received at the NASA tracking station at Robledo De Chavela near Madrid, Spain. This crescent of the Earth was photographed August 23, 1966 at 16:35 GMT when the spacecraft was on its 16th orbit and just about to pass behind the Moon. MAMIYA 500 TL - 1966. Although medium foremat photography comes to mind when the Mamiya brand is mentioned, they also produced a significant number of 35mm cameras over the years. The 500 stands for the maximum shutter speed (there were also 1000 and 2000 models) and the TL stands for through the lens light metering. Most Mamiya 35mm camras such as the one above were heavy, well-built cameras and can often be found still in near mint condition. The above camera with two lenses and a teleconverter was purchased on eBay for only $12.50! ROLLEI 16S SUBMINI - 1966. The 16S was introduced in 1966 with a total production of about 20,000. It measures 1 1/4 x 1 3/4 x 4 1/4 inches and produces 12 x 17 mm negatives on 16 mm film cassettes. 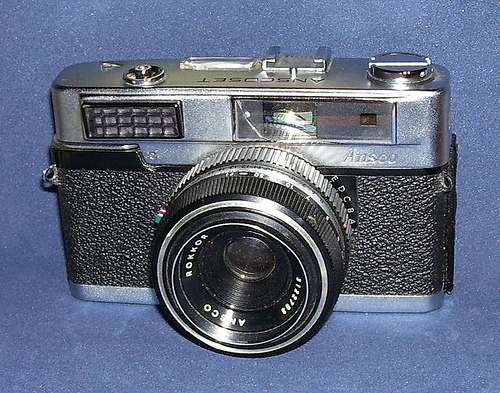 25 mm focal length, f/2.8 Zeiss Tessar lens and programmable automatic shutter. Shutter 1/30th to 1/500th second and apertures from f/2.8 to f/22. The built-in Gossen meter is coupled to the shutter and aperture scale and has provision for uncoupling for flash and time exposure. Miniature cameras such as this make an interesting collection as there are many unusual design types available at very inexpensive prices. A collection composed just of miniature cameras would be a very worthwhile and enjoyable pursuit. 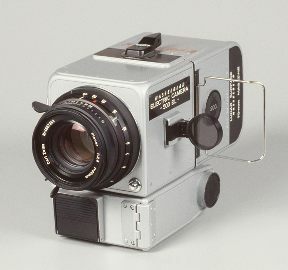 ROLLEI 35 - 1966. 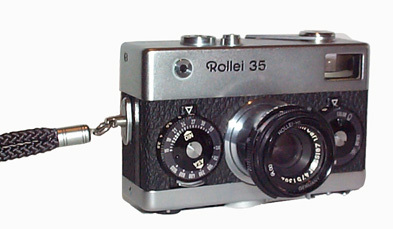 The Rollei 35 was introduced at the Photokina exhibition in Cologne, Germany in 1966. It was Rollei's first 35 mm camera - world's smallest camera for 35 mm film, packed with superb optical and mechanical workmanship and small enough to fit in a shirt pocket, the world's smallest mass-produced 35mm camera. 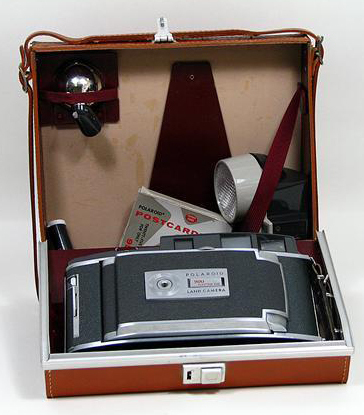 FIRST PORTABLE VTR - 1967. Sony introduces the first portable VTR, the DV-2400. 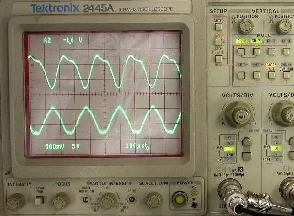 TEKTRONIX C-12 - 1967. In addition to the everyday cameras that we are all familiar with, there are zillions of cameras (my wife told me a thousand times not to exaggerate) specially adapted for industrial or scientific requirements. 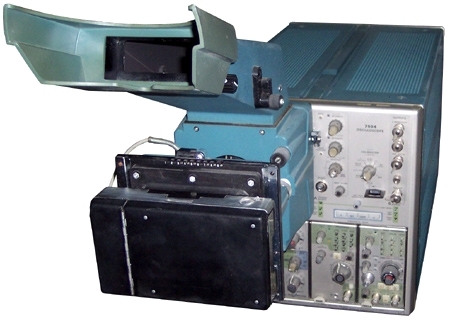 Above is one such camera, the Tektronix C-12 Oscilloscope camera used to record oscilloscope cathode ray tube (CRT) traces. The first photo is the C-12 with a Polaroid back attached. The second is of a typical Oscilloscope and the third is the C-12 attached to an Oscilloscope ready for use. 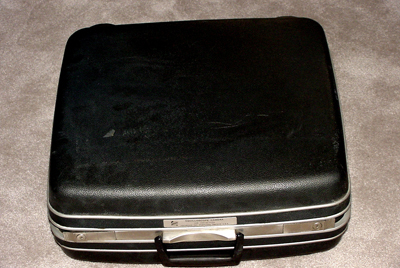 The Tektronix camera came in a fitted hardcase similar to a Samsonite suitcase. If you are interested in starting some type of camera collection, one possibility is out-of-the-mainstream cameras such as the C-12. Judicious buying can result in a nice collection at very little cost. The above C-12 in like-new condition with case was obtained on eBay for a winning bid of $1! KODAK CAROUSEL 750H - 1967. 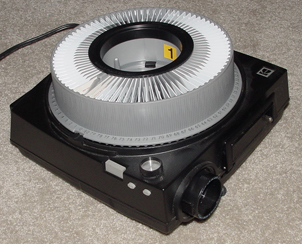 One of many types of slide projectors produced over the years, but the space-efficient rotating design of the slide tray made it the most popular among consumers. 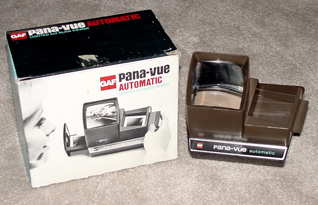 For individual viewing of slides, a small battery lit viewer such as the GAF Pana-Vue can be used. FIRST SOLID STATE IMAGER PATENT - 1968. "All Solid State Radiation Imagers." U.S. patent # 3,540,011. Filed September 6, 1968, granted November 10,1970. Abstract: " A flat screen target for receiving and storing an optical image is composed of an array of photosensitive diode elements each serially connected with a capacitor to form an array two terminal devices having each of their respective first terminals interconnected along a plurality of row lines and each of their respective second terminals connected along a plurality of column lines. Sequential coincident pulses are applied along respective row and column lines for reading the stored condition of each two terminal device." Designers: Edward H. Stupp (Spring Valley NY), Pieter G. Cath (Briarcliff Manor NY) and Zsolt Szilagyi (Ossining NY) - research engineers and physicists at Philips Labs in Briarcliff Manor NY. Patent assigned to Philips Corporation (U.S. Patent Office). Breadboard models of the device were constructed. YASHICA SUPER 60E / 40E MOVIE CAMERAS - 1968. 60E: Lens: Yashinon-DX El. Zoom 1,8 / 8 - 48 mm. Microprism Focusing. Auto Zoom. Frame rates: 12,18,24 + single frame. Auto Exposure. Backlight Control. +/- correction for auto. Remote control socket. No sound. 4 X AA batteries + No separate battery for light meter. MSRP about $240. 40E: Lens: Yashinon-Dx El. Zoom 1,8 / 9 - 36 mm. Microprism Focusing. Auto Zoom. Frame rates: 12,18,24 + single frame. Auto Exposure. No sound. 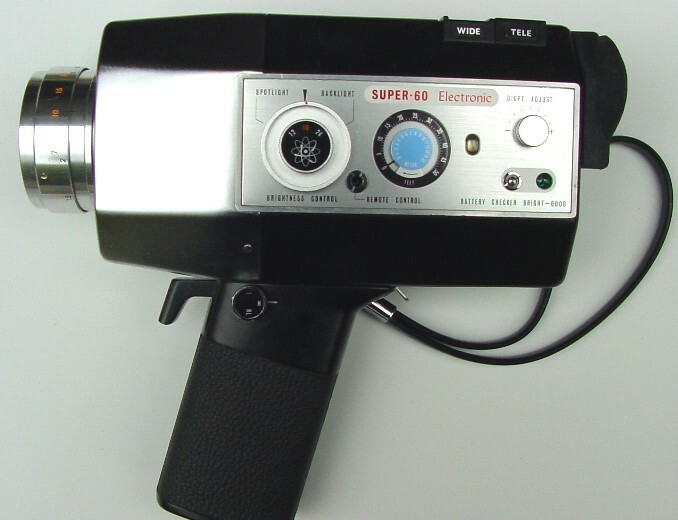 Electronic movie cameras of this type were a boon to amateur movie makers who were used to over / under exposed film as a routine matter when dealing with movie cameras that required the operator to guess at correct aperture and focus. For you collectors, the 40E was purchased on eBay in like-new condition for $1! B&H AUTOLOAD 308 - 1968. The 308 was purchased on eBay with case and manual in like new condition for $17. The original MSRP was $100, which would be $671 in 2013 dollars. 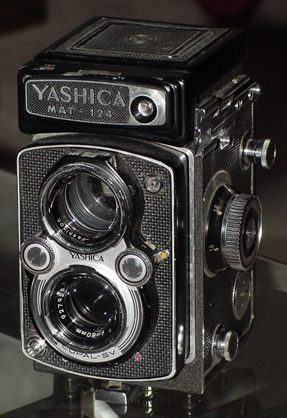 YASHICA-MAT 124 - 1968. 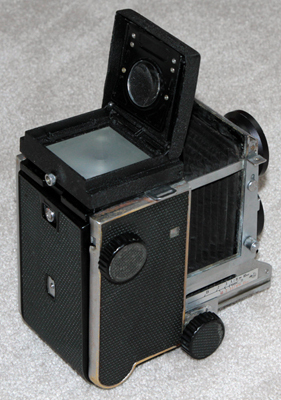 Typical twin lens medium foremat film camera of the era. 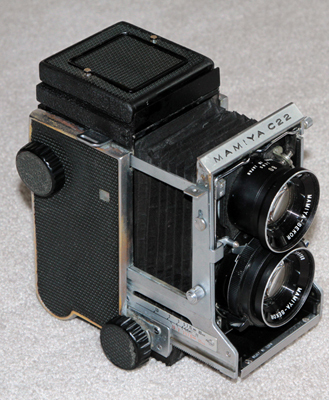 MAMIYA C22 - 1966-68. Mamiya also made a great many TLR medium format cameras of the120mm or 220mm size, but they were one of the few that made them available with interchangeable lenses - normal, wide angle and telephoto. Their bulky size and lack of internal electronics for automatically setting aperture and speed made thier sales relatively low compared to the smaller and lighter weight 35mm cameras that have ruled the amateur and semipro photography world for so long. But they may be getting the last laugh. The various Mamiya models now sell at very high premiums on eBay compared to many of their 35mm cousins, including digital models. For example, excellent condition, highly sophisticated Fuji S5200 digicams are now being offered on eBay for as little as $50 while Mamiya TLRs may be bid up to $400-500 or more. Of course, the C22 shown above didn't command nearly that much of a price due to its abysmal condition. It appears to have been stored for safe keeping in the community garbage dump! Even so, with a lot of elbow grease, krinkle paint, and the addition of an excellent quality lens, it makes a reasonable display item. Total cost for both camera and lens, including shipping, was $73. 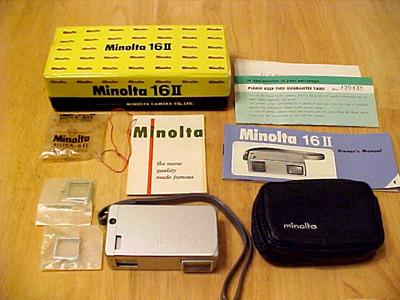 MINOLTA AUTO-SPOT 1 - 1968. Before built-in light meters became common many photographers used hand-held light meters of various types to help ensure a properly exposed photograph. Even after camers with built-in light meters came onto the market many photographers continued to use separate light meters, and some still do today. 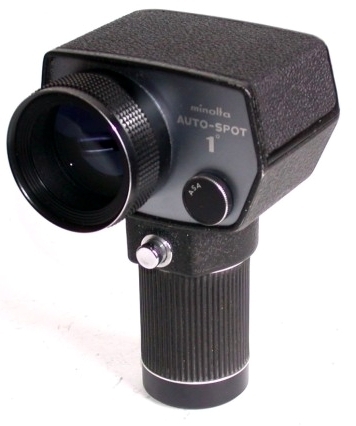 The Minolta Auto-Spot 1 was a spot meter of somewhat unusual design and very popular with users of the Zone system for larger format cameras. Using this meter was the equivalent of metering a scene with a 2000mm lens attached to a 35mm camera. It was large, heavy and expensive, but accepted filters, had a focusing lens, and had a circular readout in the viewfinder which automatically showed a full range of usable f-stop/shutter speed combinations. FIRST PHOTOGRAPHS OF EARTH FROM THE MOON - 1969. The descent to the moon by the lunar lander from Columbia, the command module, encountered numerous difficulties. Communications were poor and a number of alarms signaled potential problems with the lander. An abort situation seemed imminent, but the astronauts took manual control of the lander and maneuvered it across an area strewn with large rocks to a safe landing position, touching down with only 20 seconds of fuel to spare. 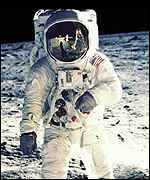 As the lunar lander (Eagle) settled into the fine dust of the moon's surface, Neil Armstrong, commander of Apollo 11, spoke man's first words from the moon: "Houston. Tranquillity Base here. 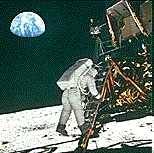 The Eagle has landed" A Westinghouse television camera attached to leg of the lunar lander broadcast live images of man's first walk on the moon, 20 July 1969, as Commander Armstrong stepped from the lunar lander. The first words spoken by Commander Armstrong from the moon's surface were: "That's one small step for a man, one giant leap for Mankind". See NASA's home page for an unlimited number of photos of the moon, the planets, the sun, our galaxay, and the universe. Click on footprint and Earthrise images to see enlarged views. Westinghouse camera on the right. THE CCD, CHARGE-COUPLED DEVICE - 1969. 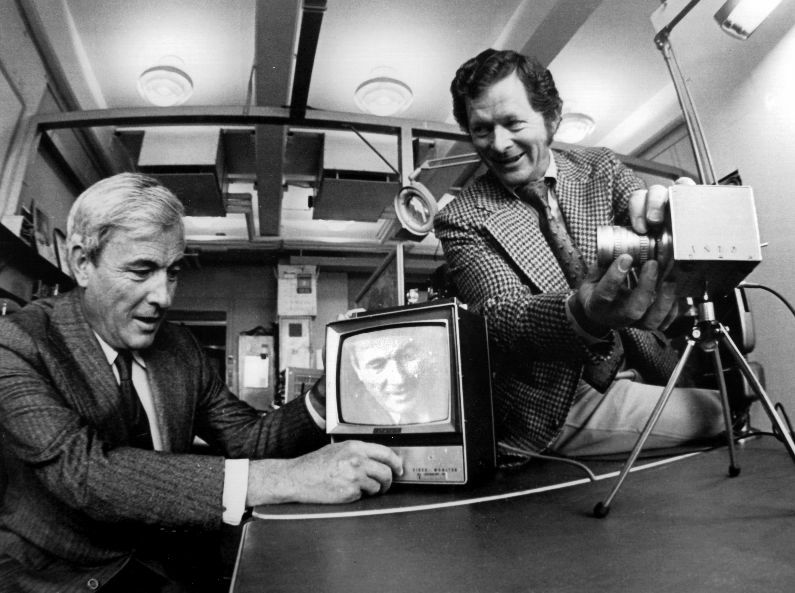 Willard Boyle and George Smith originated the basic design for the CCD. The CCD is a light-sensitive integrated circuit used in a wide variety of applications, primarily imaging. In the space of an hour on October 17, 1969, Boyle and Smith sketched out the CCDs basic structure, defined its principles of operation, and outlined applications including imaging as well as memory. The device they invented stores information, represented by discrete packets of electric charge, in columns of closely spaced semiconductor capacitors. With multiple columns side by side, a CCD chip can record images. Reading out the information for processing, display, or more permanent storage, is accomplished by shifting stored charges down the columns, one position at a time. Click on image for enlarged view and photo of their original notes whereby they designed the first CCD..
A page from the lab notebook of Boyle and Smith where they write out the ideas they discussed and wrote onto a blackboard two days earlier. Boyle and Smith sent a copy of this and several other pages to Jim Janesick, an electronic engineer who worked for the Jet Propulsion Laboratory (JPL). Janesick soon became the lead engineer at JPL for developing CCDs. More on Jim Janesick and the development of CCD and CMOS imagers can be seen in the middle of the 1970s page. BELL & HOWELL AUTOLOAD SUPER 8 456A - 1969. Typical home 8mm movie projector of the era. 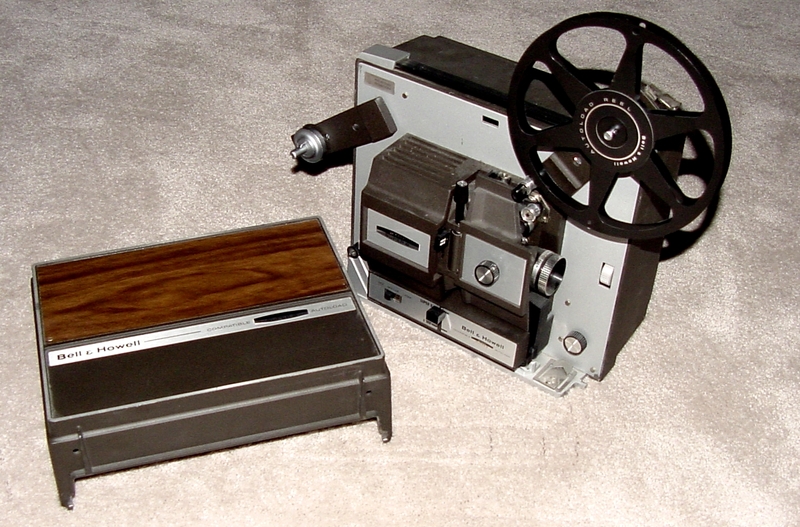 Shown below are an Argus 768 film editor and Kodak film splicer used by 8mm film photographers to edit home movies. 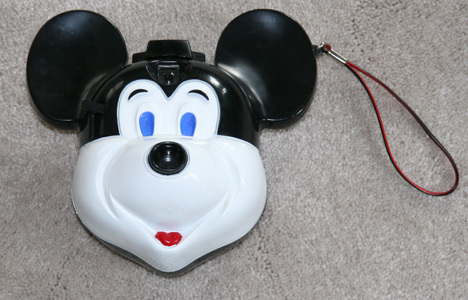 MICK-A-MATIC, MICKEY MOUSE CAMERA - 1969. 126 film camera. 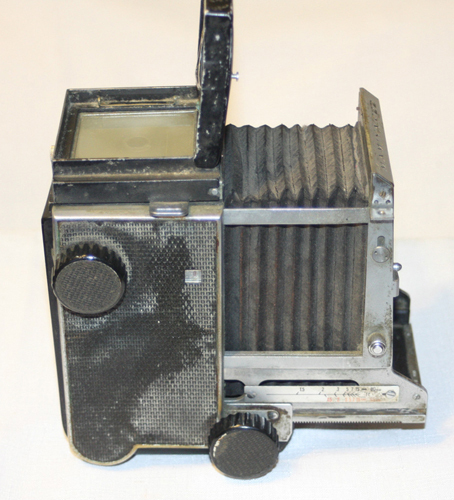 The first version of this camera used the right ear as a shutter release. Later versions had the shutter release on the side of the head. Popular Photography, January 1987, p32.